There is a rumour that the old dressing rooms had no windows so Judi Dench and her fellow cast members painted one onto the walls. And that rumour is true! Judi Dench has performed in two productions at the Young Vic. She played Lady Macbeth in Macbeth back in 1976 and Bessie Burgess in The Plough and the Stars in 1991. Fact 4: Did you ever wonder why our box office looks unfinished? It is because every single tile in the box office is authentic – they are the original tiles of the Wilson Brothers butchers shop. Plus if you look on the walls, there are still some butcher hooks up from those days. Did you miss FACT #1? FACT #2? FACT #3? FACT 3: Clive Owen met his wife Sarah-Jane Fenton at the Young Vic, when they performed the leads in Romeo and Juliet back in 1988. It was one of Clive Owen’s first works after he graduated from the Royal Academy of Dramatic Art. Did you miss FACT #1? FACT #2? Even more, we love it when Young Vic friends come up with great sentences with our 40th Anniversary Season poetry magnets! @richard_fitch sends us his best sentence. We like it. Want your own set of magnets? 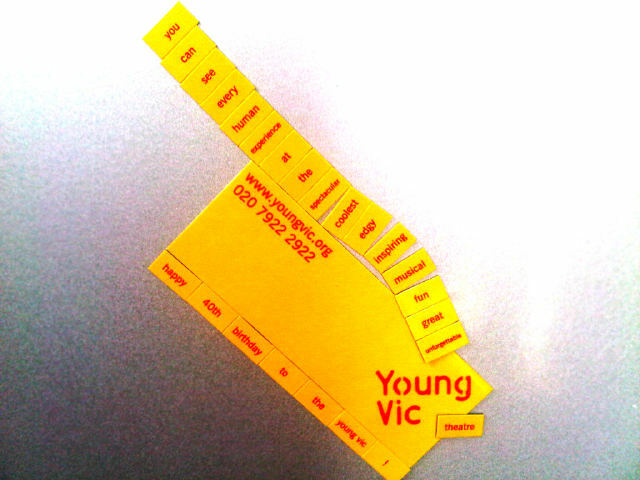 Follow @youngvictheatre on Twitter and maybe we’ll do another round of magnets soon for our weekly #TantalisingTuesdays competition! What do you do at the Young Vic? Mark Bixter on producing 40 Years Young, which took place on September 12, 2010. 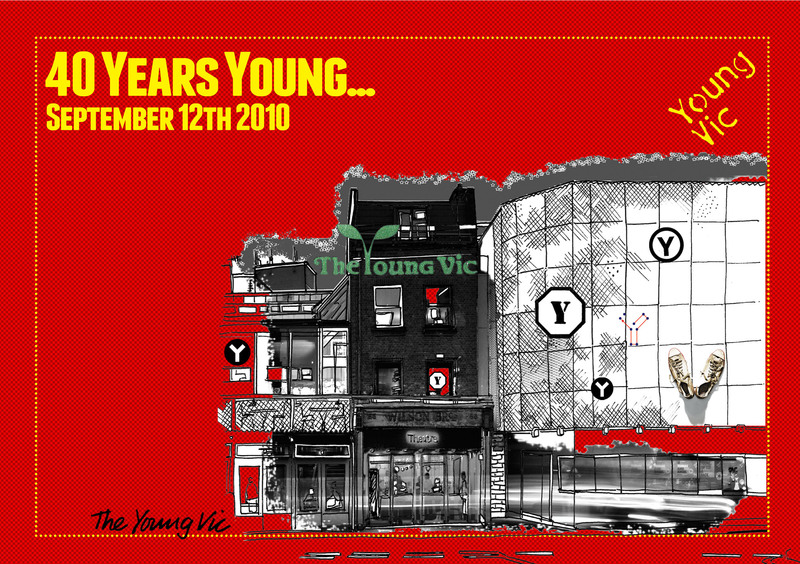 A few months back Lucy Woollatt the Executive Director at the Young Vic said “Mark – we’re planning an event to celebrate 40 years of the Young Vic would you be interested in helping put it together?” “Sure” I said “sounds good” “Great” said Lucy “We don’t know what it will be yet but I guess you’ll figure that out” and so the idea was born and with an insanely naive view of how big a task I had taken on the journey began. A few weeks later I’m introduced to Chris White who will be the director we get on very well and start brainstorming – there is no shortage of ideas, but there is a shortage of time and money so we shelve our plans for a firework display, a fly past of the red arrows and a specially commissioned song to be performed by The Who and head to the theatre museum archive to trawl through 47 boxes of Young Vic history. We start at box one, we have two aims: 1 – to get a good overview of the history of the Young Vic, 2 – to find interesting materials for a display that will completely change the look of the front of house areas. After 8 hours we have got to box number 7 – I get my first glimpse of the enormity of the job. A couple of weeks later after 3 more days sat in the bowels of the theatre museum we finally reach box 47, we have 12 boxes of stuff and cart them back to the Young Vic. From our research we have a working knowledge of productions and staff from the past 40 years and begin to set plans in place. Aside from the front of house display we decide to interview as many people as possible who have worked at the Young Vic for a listening post, we will speak to all the artistic directors (Frank Dunlop, Michael Bogdanov, David Thacker, Tim Supple, Julia Bardsley and David Lan) and ask them what they feel defined their tenure and represent it in the main performance, we will include some work with young people, we will include some music from Young Vic shows, we will look at Shakespeare as there have been so many Shakespeare productions, we will have some new writing… in short the event starts to take place. We started celebrating our 40th Anniversary this weekend, as we officially turned 40 last Friday! Thanks to everyone who’s been wishing us well – especially our friends on Facebook and Twitter. We are overwhelmed by everyone’s support. BBC did a short piece on us yesterday – click here to watch it. And well done to everyone involved in The Human Comedy, especially the 80 members of the cast who come from the community of Lambeth and Southwark that we are… we are proud of you! I was asked to come into the Young Vic and film a rehearsal of The Human Comedy on the day that the cast had their first rehearsal on the Main Stage. This short films’ primary use was to go as part of a trio of shorts I shot (as part of the up and coming Media Lab) for The Young Vic on their 40 Years Young anniversary. It was a very busy day as it was also The Cast and Community’s first day of Tech in amongst the set (designed by the ridiculously talented Jon Bausor). I found that I had very little work to do, there were so many things happening that all I had to do was point and shoot and 9/10 I caught something interesting. To add to the rehearsal footage, I interviewed the a-for mentioned Designer Jon, the actors Brenda Edwards and Terel Nugent, and members of the community choir; Ceilidh, Anthony, Kayode, Tyrel, Zoe and Cathy. The thing that struck me about them all is their excitement and passion of being involved in this production. All in all I hope this video encapsulates one of the many things that make the Young Vic unique; its involvement with the local community, and its ability to make all who take part, feel like a star.